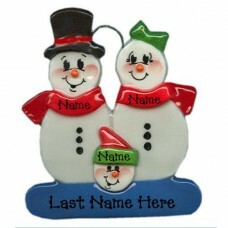 Everybody loves a snowman and this is one of our most popular ornaments. Mom, dad, grandpa or grandma will surely enjoy this ornament on their tree. This ornament also makes a cute name tag on top of a wrapped present. INSTRUCTIONS: Please complete all fields you wish to personalize OR check the box marked DO NOT Personalize. If you do not complete these fields, nothing will be printed on your ornament. It will be sent to you blank. Thank You!